–>set up a strategic Judeo-Sunni Alliance against Shiite Iran . Contrary to a popular idea, the neoconservatives are not the enemies of Iran, and not the friends either. They have always considered that it was necessary to maintain a balance between Arabs and Persians. This was why Elliott Abrams participated in the « Iran-Contras operation », which notably consisted of selling Israëli weapons via Sheik Hassan Rohani (currently the Iranian President) to Ayatollah Hachemi Rafsandjani (who consequently became the richest man in his country) in order to resist the Iraqi attack (which was also commanded by Washington). This operation was carried out without the knowledge of Congress, then condemned, and later amnestied by President Bush Sr.
Sheikh Hassan Rohani, who campaigned in 2013 by repeating ceaselessly that his country should no longer spend one rial to liberate Palestine and support Hezbollah and Syria, has undertaken nothing with his allies since his election. 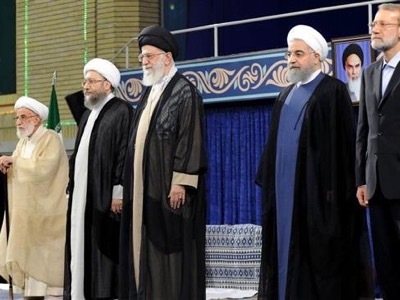 Progressively, the Guardians of the Islamic Revolution have stopped defending Syria and have only offered their support to Damascus in order to come to the help of the Chiite minority. For almost two years, Teheran has sent no ambassador to Damascus. It was only in 2018 that Iran sent senior civil servants of its government to Syria. They signed economic agreements which had been drawn up five years ago and which no longer correspond to the needs of the Syrian people. Seeking to convince Ayatollah Ali Khamenei to withdraw the Guardians of the Islamic Revolution from Syria, President Sheikh Hassan Rohani reached out to Turkey (with whom his friends maintained excellent relations) and to Russia. And yet Sheikh Rohani had already negotiated with the United States and Austria for the delivery of Iranian oil instead of Russian hydrocarbons to the Europeans. In any case, the three countries have effectively expressed their points of view. However, the last meeting in Teheran with Presidents Vladimir Putin and Recep Tayyip Erdoğan was a failure. It was immediately followed by a meeting between Russia and Turkey where their differences were settled without the Iranians.